There are many challenges in life for which I believe I am unprepared: landing a disabled aircraft, selecting a paint color for a formal living room, lecturing on physics or attending a baby shower. The next big life hurdle staring me in the face is being a band parent. Doesn’t he just look like Dizzy Gillespie? Last Saturday Barron took possession of a trumpet, loaned to him by my friend, Brian, himself, a veteran of high school and collegiate marching band. Since that time, what could be mistaken for the love-sick mating call of the Canada goose has been reverberating off my rafters as Barron “familiarizes” himself with the instrument. His brothers take particular delight in how the “music” Barron coaxes from it resembles the sound of flatulence or other bodily functions boys of a certain age find hilarious. Somehow I don’t think Barron’s band instructor will find these noises quite as humorous. This is completely new turf for me. While I enjoy music, particularly the singer-songwriter, folksy-country variety, I have not an ounce of musical talent. I made it as far as flutophone, for which I earned a B- in second grade. And please, don’t get me started about my singing. I and those misfortunate souls who attended Sunday night church are still recovering from the emotional scars of my singing solos. I did grow up with musicians in the family. One of my strongest memories of my childhood was my mother practicing her voice lessons to a cassette tape. Now those were some interesting vocalizations. And my middle brother played several instruments, including the baritone saxophone, which he used to sneak up behind me while I was doing homework and blast a fog horn tone in my ear. But now, I am the parent of a band member. It’s early yet in his career, but after nearly two years with the guitar, a more gentle, soothing sound to be sure, we are entering unchartered waters. I want to be supportive, but I really don’t know what to do. I guess wearing earplugs would send the wrong message. Here’s what I know about band parents: they work a lot of hours in concession stands. They sell lots of gift wrap and magazine subscriptions. They incur huge dry cleaning expenses. They form tight bonds with other band parents. Back in the day, I spent most of my extracurricular time in athletic pursuits, not that I had much more athletic talent than musical talent. Everything I know about band I learned from watching my brother, including going to his concerts, which — don’t tell him — I kind of enjoyed. 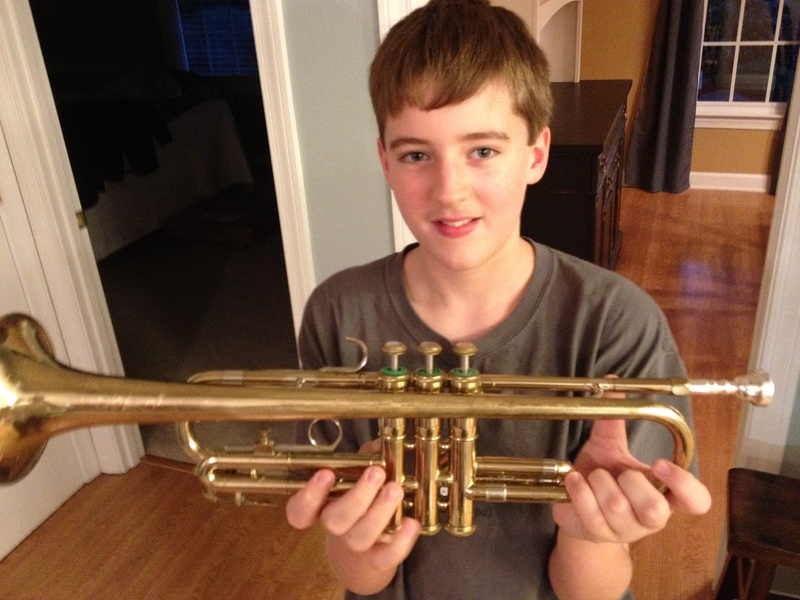 Brian’s trumpet has been through enough marching seasons that whatever Barron dishes out shouldn’t phase it. Thanks, Brian, (I think) for loaning it to Barron! I will never forget the first middle school band concert I attended. After the first selection, the band teacher approached a petite girl with a French horn. He gently took the horn from the girl, removed the spit valve and in full view of the gathering, drained what seemed to be 32 ounces of saliva. Some lessons are best learned through humiliation, I guess. Perhaps I’m getting the cart before the horse on this whole band thing. Maybe when the fun of blowing loudly at his brothers has worn off and he actually has to practice, Barron may decide to go in another direction. But if he sticks with it, I’ll be right there, attending every performance, working my turn in the concession stand and selling gift wrap and magazine subscriptions to raise money for the band trip to Washington, D.C., or wherever. I’ll beam with pride as he plays Sousa and Beethoven and whatever else trumpet players play these days. 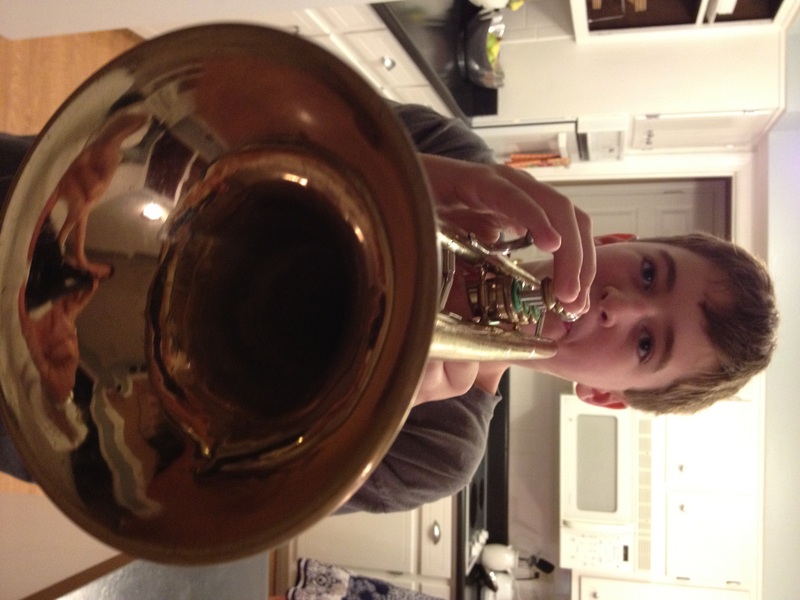 I have just one question: does anyone know if a trumpet has a spit valve? What helpful suggestions would you offer a rookie band parent? Share your experiences and thoughts by leaving a comment below. It’s cheaper than therapy! This entry was posted in Uncategorized and tagged band, band fundraisers, band trip, band uniforms, Barron, brothers, children, contemporary South, family, guitar, Lance Elliott Wallace, Lance Wallace, learning to play trumpet, middle school band, New South, New South Essays, NewSouth, parenting, South, Southern, Southern Culture, Southern Living, Southern music, Southerners, the South, trumpet. Bookmark the permalink. Yes. A trumpet has a spit valve. And your son takes great pride in opening it and grossing out his brothers with a long string of slobber hanging from his trumpet. Have you not seen this trick yet? The previous comment was made by me while I was logged in as Lance. Sorry! Nothing is sacred around here–not even passwords. So mom is admitting it was torture! Maybe musical talent skips a generation, and Barron will have your knack for the instrument and Mom’s grasp of music theory. I have neither! Start saving yesterday! Band is expensive… and my parents even went so far as to buy me a car in high school, because they were tired of driving me to every rehearsal I had all over town. Also – you may want to go ahead and put some encouraging words in your back pocket for all the competitions, auditions, and concerts that don’t go as well as he had hoped. Get some Chris Botti for inspiration!